Judy Pancoast's Masters Degree in Education/Reading informs all of her songwriting and helps to make her the ideal choice as a library program presenter.Since 1996 she has performed at hundreds of libraries all over the United States, and has been on the select roster of the New Hampshire State Library's "Kids, Books & the Arts" Summer Reading Program six times. 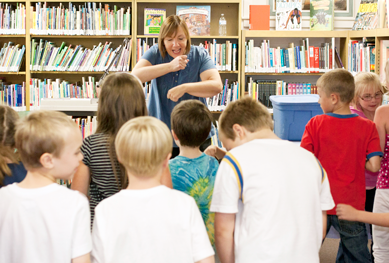 Librarians rave about her lively, original and interactive musical programs which can be adapted for any Summer Reading theme, and have also booked her for many Children's Room holiday parties and events. "Thanks so much! We had a great time and our customer comments were through the roof!" 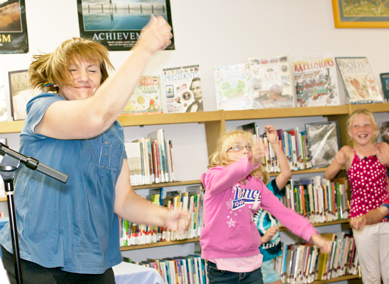 Find out how much a library can rock with Judy Pancoast! Judy has been presenting concerts of fun-filled original tunes like “Take Me to Your Reader,” and “The Lost Library Book Blues” for 21 years. For 2018 Judy will invite children into “Judy’s Tune Room” to enjoy a 45-60 minute concert featuring original songs in a variety of styles from pop (“Once Upon a Time”) and rock (“A Little Bit of Elvis”) to country (“The Only Bug at the Rodeo”) and jazz (“The Dog Did It”). During the concert Judy will also share her songwriting secrets about how she gets inspired and what goes into creating her songs. The children will even help Judy turn one of their own ideas into a short, memorable and melodic song. There will be lots of dancing and singing along as Judy’s enthusiastic, kid-friendly personality makes each concert experience special. And of course, Judy will tie in many of her songs with children's books and encourage the kids to read, read, read! We anticipate a lot of library bookings for the theme "Libraries Rock!" and, in fact, the calendar is already starting to take shape. Be sure to reserve the date you want by contacting Judy ASAP at judy@judypancoast.com or call her at (603) 716-3646. She's New England's own Grammy Nominee for Best Children's Album and her songs are popular all over the world! Don't miss your chance to bring her to your library for the theme that was made for a Judy Pancoast program – MUSIC! Remember that Judy LOVES libraries, and therefore her rates are always negotiable with great discounts for block bookings. Dates are already being filled, so email Judy here or call her today! March 2, 2015 - Last week during school vacation we had a Winter Warm-up event with Grammy nominated, singer/songwriter Judy Pancoast. We had 65 in attendance and Judy had everyone up on their feet ‘Swimming in Jell-O’ (my granddaughter’s still singing it!) and swaying on our surfboards to ‘I Can’t Go Surfing” along with many other of her other original songs. Although she’s well known, I just wanted to convey that she provides a wonderfully engaging performance at a reasonable price. She appeals to both children and adults and her energy is contagious. Thank you for performing at Bethlehem Public Library’s “Dream Big” Summer Reading Program Kickoff. The turnout was great and your performance got the kids moving and grooving! They have been flocking to the library since your performance to sign up for the reading program – some of them humming “Dream Big”. Your songs provided inspiration and reinforced the importance of their local library in their lives. What a way to kickoff our summer reading program! Thank you again!! Pensacola (FL) Public Library System. Contact Judy now to book one of the above programs or to invite her to design a musical program around your theme. Like so many other librarians who have invited her back time and time again, you'll be delighted with the way she lights up your library! "We are so excited about having you for kick off - your show is so energetic!!"